I'm very excited to be part of this years Light Night festival in Liverpool, particularly since this year's theme is Time! Specially commissioned pieces will be shown as well as a range of activities, shows, exhibitions etc around the city next Friday the 19th of May. Supported by the Edinburgh College of Art, designer Larissa Pschetz, artist Katharina Ludwig and I will be contribution an installation called The Memorial for Misused Time. Fittingly we are going to be based in the Hall of Remembrance in the city's Town Hall. The memorial draws on the idea of Brazilian prayer ribbons and will explore ideas of scheduling, efficiency and coordination with others. I'll also be talking about my work around critical horology from 6-9pm at "What if we could remake time?" There'll be a panel of respondents and lots of time for Q&A with the audience. If you are around in Liverpool, don't miss it. Lightnight is one of the highlights of the year. With the finalisation of a new paper “Liberating Clocks: Developing a critical horology to rethink the potential of clock time”, which will be coming out in a special issue of new formations on the topic of “Timing Transformations”, I wanted to reflect a little on the idea of a ‘critical horology’. Partly to ask why no such area of practice and research has yet been developed. Unlike its more famous and well established cousin, critical cartography, there seems to have been no move to pull horology – “the art or science of measuring time; the construction of horologes” (OED) – into more critical frameworks. In their overview of critical cartography, Crampton and Krygier argue that it “challenges academic cartography by linking geographic knowledge with power, and thus is political” (11). They also offer two reasons why cartography has opened up to more experimentation and redesign. The first is that mapmaking is no longer only in the hands of the experts. And secondly “a more social theoretic critique, which we argue is a political one, situates maps within specific relations of power and not as neutral scientific documents” (12). Importantly critiques of maps and their roles in these power relations has not weakened map making, but has allowed others to “make competing and equally powerful claims” (12). They therefore conclude that “this one-two punch–a pervasive set of imaginative mapping practices and a critique highlighting the politics of mapping–has undisciplined cartography” (12). Looking for this one-two punch in relation to horology, turns up very little however. Firstly, while cartography has expanded to include methods for crowd mapping, participatory GIS and community mapping (for example), descriptions of the role of a horologist and the kind of training they might receive, focus specifically on the technical expertise gained and the ability to make and repair objects that measure time in a relatively neutral way. This training is by and large undertaken outside of the university, and one wonders what improved conversations with arts, humanities and social science researchers may have in opening up established technical practices (as Crampton and Krygier claimed for cartography see p 12). In many ways, then, clock-making remains in the hands of the experts. Secondly, as I argue in my paper, in a range of core areas of social theory, clock time remains under-theorised and fundamentally misunderstood. Continental philosophers, for example, continue to regularly equate clock time with an ‘objective time’ or ‘universal time’. Indeed rather than turning towards the clock to develop more critical approaches, the tendency for phenomenologically inspired philosophers is to use the clock as a referent for the kind of time they don’t want to talk about. As a result, the clocks seems to have become practically irredeemable as a tool of critique, or political transformation. This is a significant problem because it means that philosophers have willingly absented themselves from debates about the crucial role that clocks, and the time they tell, play in everyday life. All is not as dire as this though, with scholars in other disciplines pointing to the contingent and historical nature of what we now call ‘clock-time’, and showing that there are multiple possibilities for measuring time and ‘constructing horologes’ otherwise. Here I’m thinking particularly of anthropologist Kevin Birth, with his approach being pithily summed up in the following quote: “Every clock tells a story. Every clock takes a position in a debate about time. Every clock is an attempt to shape how people think about time” (Birth, 2013). 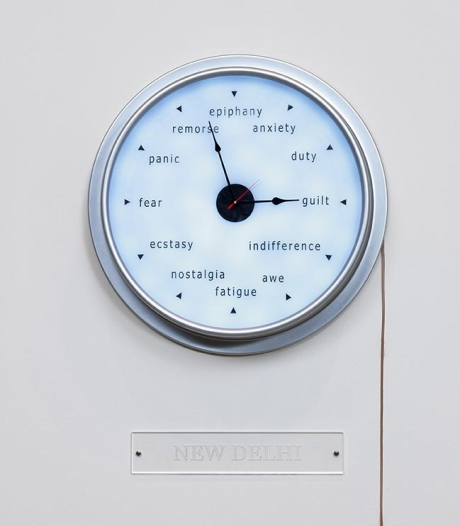 In addition, while there is not yet a form of ‘community clocking’, as my tumblr shows artists, activists, designers and others have indeed been creating clocks that tell competing stories. Here we might take further inspiration from Denis Wood who argues that “Map artists...claim the power of the map to achieve ends other than the social reproduction of the status quo. Map artists do not reject maps. They reject the authority claimed by normative maps uniquely to portray reality as it is, that is, with dispassion and objectivity” (quoted in Crampton and Krygier, 25). Likewise these ‘clock artists’ or temporal designers, reject the normative clock as the unique portrayal of the reality of time. We have not yet got to the position, however, that Crampton and Krygier describe, where “the ability to make a map, even a stunning interactive 3D map, is now available to anyone with a home computer and an internet connection” (12). Indeed perhaps the most prominent story of a hobbyist making their own clock, involved a child’s arrest. A critical horology could thus have much to learn from critical cartography, including encouraging conversations between clock makers and theorists, and encouraging wider access to the construction of clocks. As Crampton and Krygier argue, “a critique is not a project of finding fault, but an examination of the assumptions of a field of knowledge” (13). Thus a critical horology is not so much a challenging of horologists, as an effort to support broader questioning of the underlying assumptions about what a clock is, what kind of time it can tell and what it brings into relationships. To show “how they came to be, and what other possibilities there are” (ibid 13). 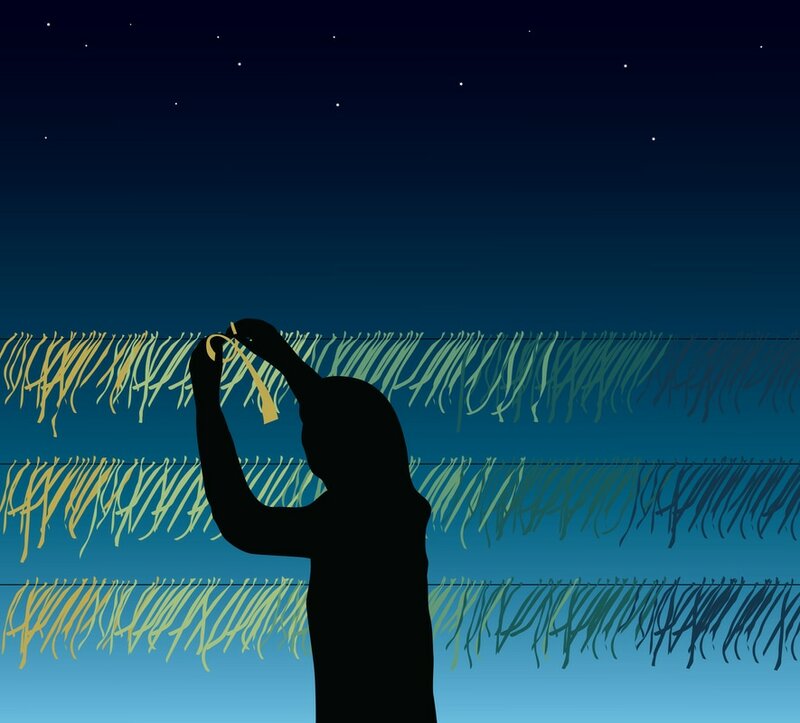 You can read the preprint version of “Liberating Clocks: Developing a critical horology to rethink the potential of clock time” here. Birth, Kevin K. 2013. "Clocks, Politics, and Changing Times." Precision and Splendour Exhibition Lecture Series, Frick Collection, New York, 16th October 2013. Crampton, Jeremy W., and John Krygier. 2005. "An Introduction to Critical Cartography." 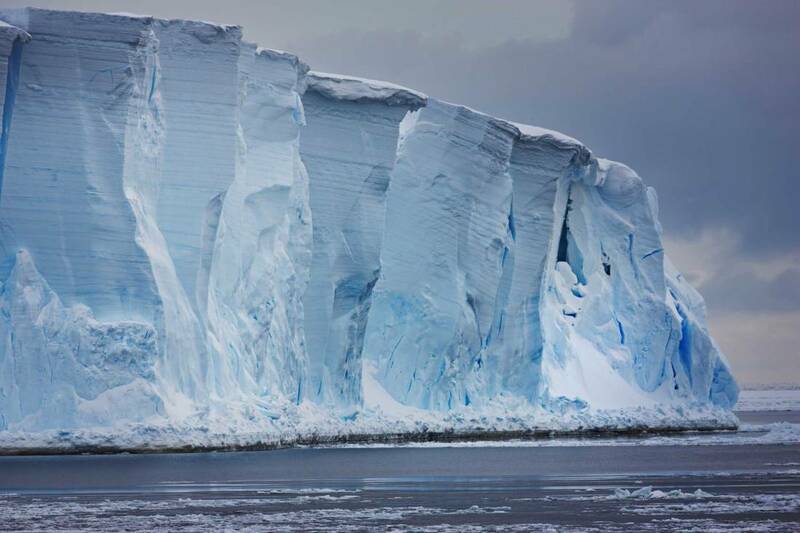 ACME: An International E-Journal for Critical Geographies 4 (1):11-33. 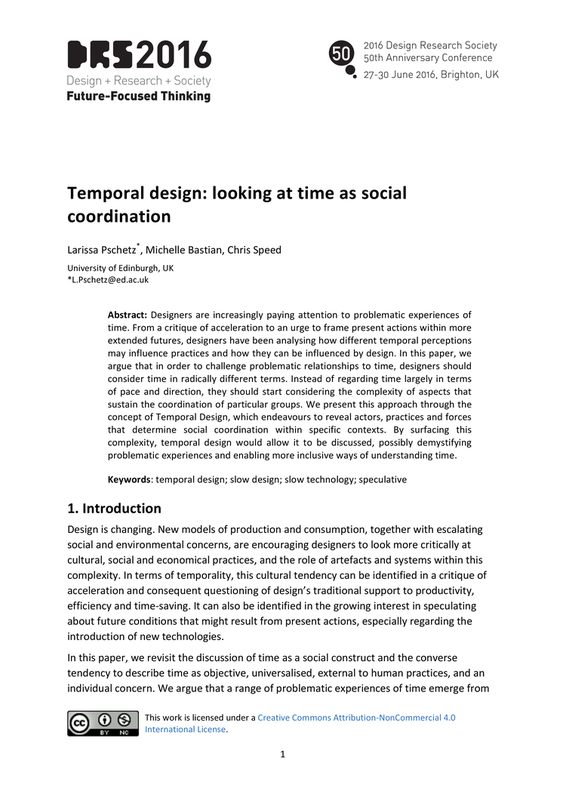 Larissa Pschetz, Chris Speed and I have been working on the idea of Temporal Design for the last couple of years now. We've had a couple of events, which have been fascinating. Our first joint paper builds on Larissa's earlier work to set out what we see as the core principles for designing with time. Click on the image for further details, or download the paper. Proposals due 18th January 2016. Read more over at the Edinburgh Environmental Humanities site. 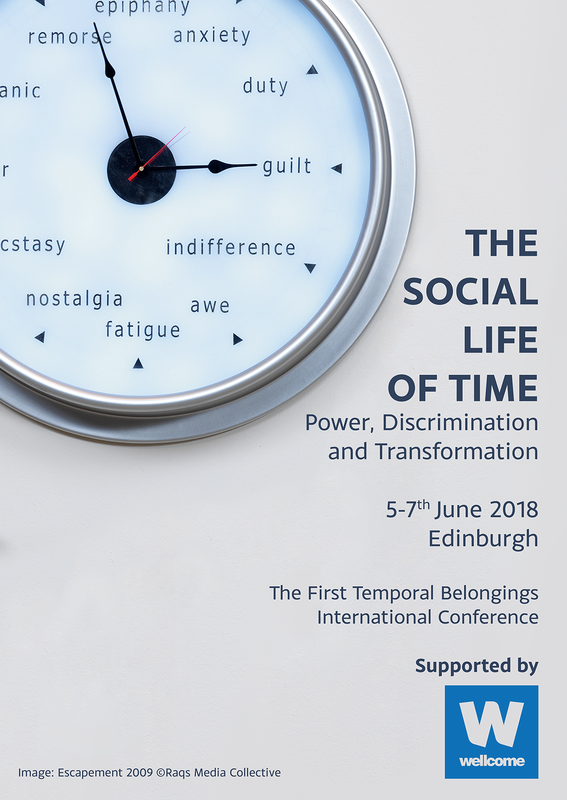 ﻿I'm pleased to announce a second event in the Temporal Design series that we’ve been developing here in Edinburgh. This will be a small workshop format, but all welcome. Further information and the link to register is below. The second in the series of Temporal Design events hosted by Design Informatics (ECA) will focus on the tactics used to negotiate time in everyday life. We are particularly interested in asking how design might support or hinder what we are calling ‘vernacular temporalities’. That is, the idiosyncratic modes of dealing with and understanding time that are locally constructed in response to specific contexts and which may not fit the more regulatory infrastructures that dominate thinking about time. practices play an important role in shaping temporality, they are often enacted in an unreflective way, rarely noted or discussed. Indeed in our first workshop, many participants suggested that it had been the first time they had even articulated the daily practices they had developed to deal with temporal demands. The aim of this workshop, then, is to surface the role of these temporal practices and their effect on broader social contexts, discussing how artefacts and systems may work as triggers, projections, facilitators or obstructions to these practices. The workshop will feature four speakers from design and design theory, whose work touches on different aspects of temporality. They will each highlight a specific artefact, and there will be the opportunities for attendees to participate in reflecting on these talks and/or selected objects throughout the event. The workshop is free and open to all disciplines. Organised by Larissa Pschetz, Jane Macdonald, Chris Speed and Michelle Bastian, Design Informatics, University of Edinburgh.